Batty Langley was baptised in Twickenham on 14 September 1696 the eldest of eight children born to Daniel and Elizabeth (née Phillips). Daniel was a jobbing gardener and was himself born in Twickenham, in 1670, the son of Thomas who died when the boy was five years old. Batty followed Daniel in his occupation but greater ambitions later took him to London. 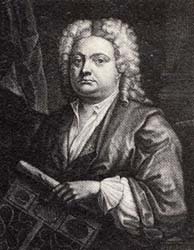 It is possible that Daniel had acquired a patron: David Batty, who had married a widow, Judith Buckland in 1696. Judith's first husband, John Buckland, a tailor had died in 1694 leaving her with a reasonable inheritance and so together they were comfortably placed: for several years David rented the Park, a piece of land amounting to about 7 acres to the east of London Road and a part of the Twickenham manor land. He attended Vestry meetings, taking Daniel with him and entering into the management of the parish as Overseer of the Poor in 1698. Later, Daniel stood, unsuccessfully, for election to this post. In 1703 Daniel bought a one-third share in a pew in the church. Having named their eldest son Batty (a name held to be a corrupted diminutive of Bartholomew, first shortened to Barty) they named their eldest daughter Judith. David Batty's rates were fully abated in 1713: he may have died although there is no record of his burial. Judith died and was buried the following year. The Langleys, perhaps now deprived of their patrons, did not seem to prosper. At first Batty Langley took up gardening and there is a record of his occupying land in Cross Deep next to the main garden of Radnor House. In 1719 he married Anne Smith, probably a local girl from a family perhaps connected with this land. There were four children of the marriage before Anne died and was buried in Twickenham on 25 June 1726. Batty did not remain long in Twickenham: he is recorded as paying rates only in 1722. In 1723 the Churchwardens twice paid sums of money to his wife and children: had he left home? His second marriage produced ten children, the fifth christened Batty amongst Euclid, Vitruvius and Archimedes. He died in London in 1751 but was remembered locally by a branch of his family: in 1767 Langley cousins in Teddington christened their son Batty. a projected design for Orleans House prepared by Batty Langley. His main Twickenham client was probably Thomas Vernon, for whom, like Daniel, he worked at Twickenham Park. He converted a large sandpit 'then a perfect nuisance' into a 'very ageeable beautiful' spiral garden perhaps a 100 feet in diameter with hornbeam hedges. However, Vernon died in 1726 and his widow Jane may not have continued to employ his services. 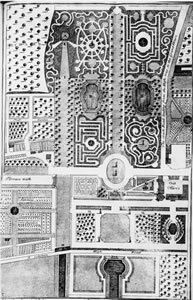 He also prepared a design for the garden of James Johnston's new house, later Orleans House, but this may have been uninvited. Batty Langley's later career is well documented. He published a large number of books, the first in 1724 was titled An Accurate Description of Newgate where his younger brother, William, had become an assistant turnkey. In 1728 A Sure Method of Improving Estates made reference to Twickenham Park, Orleans House and Lebanon Park. In 1729 A Sure Guide to Builders described the newly built Cold Bath in the riverside garden of Radnor House, of which a section survives today. His most famous and at the time, influential, book was Ancient Architecture Restored published in 1742 and reissued in 1747 as Gothic Architecture, improved by Rules and Proportions. Of this, and others, Horace Walpole later wrote: "All that his books achieved, has been to teach carpenters to massacre that venerable species, and to give occasion to those who know nothing of the matter, and who mistake his clumsy efforts for real imitations, to censure the productions of our ancestors, whose bold and beautiful fabrics Sir Christopher Wren viewed and reviewed with astonishment, and never mentioned without esteem." Probably educated beyond his natural talents, but an engaging self publicist, Batty Langley promoted himself energetically throughout his life. He remains something of an enigma although the term "Batty Langley Gothic" often used to day has ensured a continuing reputation.